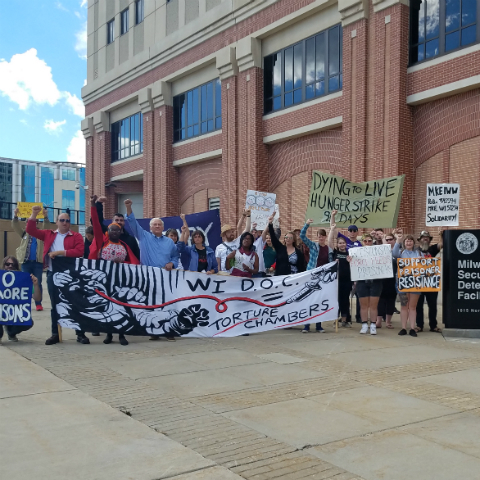 Milwaukee IWOC supports prisoner resistance in Wisconsin, the state with the greatest racial disparity for Black men in America, and truly atrocious conditions of confinement. We have over 20 currently incarcerated IWOC members, and over 500 contacts in WI prisons. In the summer of 2016 we worked with a coalition of anti-prison organizations to support the Dying to Live hunger strike, a prisoner-led action demanding a one year cap on solitary confinement, which went on for many months due to WI DOC's brutal force-feeding, torture and obstructionist tactics. Currently we're engaged in a campaign with ExPrisoners Organizing and WISDOM to shut down the Milwaukee Secure Detention Facility.